Cine Europa, the tradition of bringing excellent European films to the Philippines, has now turned 12 years old and promises to provide Filipino movie enthusiasts with a range of powerful films which will surely touch everyone's hearts and minds. 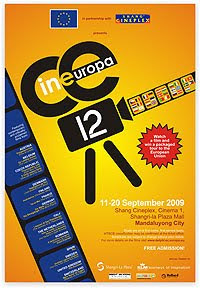 Cine Europa opens on 10 September with public screenings from 11 to 20 September 2009 at the Shang Cineplex of Shangri-La Plaza Mall, Mandaluyong City. The film festival then goes to Liceo de Cagayan de Oro for the second time from 2 to 4 October and hits Ayala Center Cebu from 9 to 11 October. Ciné Europa 12 continues its tradition of further enhancing dialogue between European and Filipino cultures through the silver screen. Eighteen European films from Austria, Belgium, Czech Republic, Denmark, Finland, France, Germany, Italy, The Netherlands, Romania, Spain, Sweden, Switzerland and the United Kingdom will further endear Europe to Cine Europa enthusiasts in Manila, Cagayan de Oro and Cebu. This year's selection of movies, carefully handpicked to cater to the Filipino audiences, showcases the range and breadth of emotions from the different stories of love, laughter, hope, despair, survival, courage and, steadfastness. While approaches may vary from country to country, Filipino audiences will be able to empathize with the different characters in each of the films. Opening the festival is a Swedish film "Grabben I Graven Bredvid" or "The Guy in the Grave Next Door" by Kjell Sundvall, a contemporary love story between a farmer and a city girl set in the countryside. This year's film festival has a new special feature that should prove particularly endearing to Cine Europa enthusiasts, as one lucky member of the audience will travel and tour Europe courtesy of KLM Royal Dutch Airlines and Rajah Travel Corporation. Through the years, Cine Europa has earnestly experimented with different ways of reaching out to Filipino audiences and to enliven its programme of events. The festival has helped strengthen EU-Philippine cultural relations and has become a lasting gift to the Filipino people. Cine Europa, which started in 1998, remains a distinctive acknowledgement of the partnership of the European Union with the Philippines by way of sharing with the Filipino public the diversity and uniqueness of European film culture. Admission to the screenings is free on a first-come, first-served basis. Cine Europa 12 is presented by the European Union Member States' Embassies and the Delegation of the European Commission to the Philippines, with Shangri-La Plaza Mall (Manila), Arts Council of Cebu and Liceo de Cagayan de Oro (Mindanao) as partner organisations. It is supported by KLM Royal Dutch Airlines, Rajah Travel Corporation, Yo Card and Click the City.